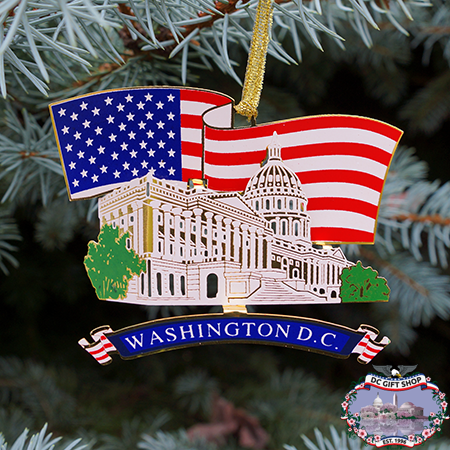 The stars and stripes wave proudly over the US Capitol Building in this colorful and festive ornament. Housing the United States Congress, Senate, and House of Representatives, as well as being the location for all Presidential Inaugurations, the US Capitol building is at the heart of western democracy. Although the main building was finished in 1800, it's characteristic dome is an architectural marvel that has captured the imagination of onlookers since it's completion in 1866. Let this fun ornament add a spark of patriotic flare to your Christmas tree this year!